Here are common questions with uncommon answers. What does not a substitute mean? What is a comprehensive eye and vision examination? What is a screening examination? 1. What is 20/20 vision? The term 20/20 vision refers to the eye's ability to see objects at both far and near distances. 20/20 refers to visual acuity or a measure of the ability of the eyes to see well. 20/20 is often described as "perfect vision." This limited idea of normal vision is based upon the work of a Dutch oculist named Herman Snellen in the 1860's. While 20/20 acuity is desirable, visual efficiency skills are needed for good vision. 2. What is visual efficiency? Visual efficiency refers to a group of visual skills important for success in school, sports, driving, and the modern workplace. Visual efficiency skills include: depth perception, color perception, and oculomotor skills such as eye teaming, eye movement, and eye focusing speed and accuracy. An individual with 20/20 vision can still have problems with visual efficiency skills. 3. What are vision screenings? Vision screenings attempt to separate those with possible vision problems (fail) from those without (pass). Failed vision screenings are referred to an optometrist or ophthalmologist for an eye examination. Vision screenings screen, not test, visual acuity and not visual efficiency. 4. What does not a substitute mean? Not a substitute means something cannot be replaced by another. If you were pulled over by a police office while driving in your car and the officer requested to see your driver's license, would a state ID be acceptable in its place? Absolutely not. A state ID is not a substitute for a driver's license. 5. What is a comprehensive eye and vision examination? A comprehensive eye and vision examination is a complete eye and vision evaluation by an eye doctor. Eye health, visual acuity, refractive status, and visual efficiency are evaluated. 6. What is a screening examination? This is a confusing term. How can an exam be a screening, too? We suspect a screening examination is a fancy word for a screening posing to be more than it really is. If it does not provide a diagnosis, and prescribe treatment when indicated, it is a screening. The use of other terms to describe a screening is discouraged. (e.g., appraisal, assesment, test) Variations in terminology are misleading to the parent and public and should be avoided. 7. What is an eye doctor? An eye doctor is either an optometrist or an ophthalmologist. 8. What is the difference between an optometrist and an ophthalmologist? An optometrist is an eye doctor who primarily diagnoses and treats visual efficiency and learning related vision problems who is also trained in eye diseases. The ophthalmologist is a medical doctor whose specialty is eye diseases and eye surgery. An optometrist is recommended for routine eye examinations. 9. What is vision therapy? Vision therapy is a sequence of activities under an eye doctor's direction. 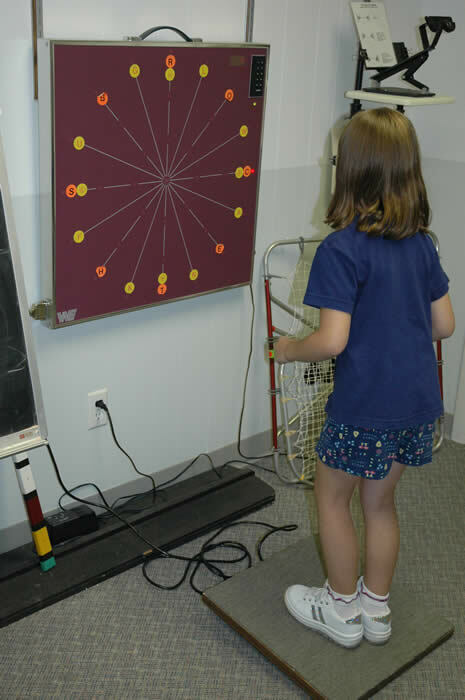 Since vision skills are learned, vision therapy provides development, practice, and improvement of visual skills necessary for classroom learning, sports activities, and everyday life. Vision therapy can help one learn to see better, faster, and easier. 10. What do the various letters mean after a name? Vision therapy improves vision skills needed for success in school and in life.